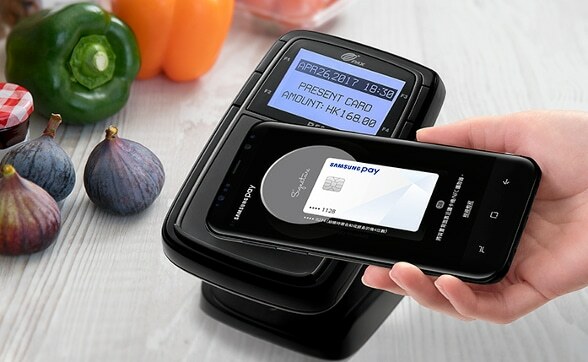 Samsung Pay has gone live in Hong Kong with support from Mastercard, Visa and American Express and banks including Bank of China (Hong Kong), Citibank, DahSing Bank, DBS and Standard Chartered. The launch takes the mobile payment service to a total of 17 markets globally and follows its debut in Taiwan earlier this month. The service will offer those with Samsung Galaxy S8 and S8+ devices the option of authenticating payments using the iris scanner on their devices and also comes with support for membership cards. DBS Hong Kong credit card customers are being offered a HK$30 (US$3.85) cash rebate when making a purchase over HK$100 ($US12.84) at any merchants using Samsung Pay until 31 August 2017, while Standard Chartered is offering its customers 25% cashback when paying with a Standard Chartered credit card through Samsung Pay until 25 June. DahSing Bank is also offering a range of deals to promote Samsung Pay. The mobile payment service is now available in the following markets — South Korea, the US, China, Australia, Spain, Brazil, India, Malaysia, Puerto Rico, Russia, Singapore, Thailand, Sweden, the UAE and Taiwan with a UK launch taking place earlier this month. The service launched in early access in Hong Kong in April this year. “Around eight in 10 (78%) of the Hong Kong people are likely to adopt new ways of paying and are picking smartphones as a device for everyday payments — we are confident the launch of Samsung Pay will provide more convenience and further accelerate the growth of mobile payment capability in Hong Kong,” says Caroline Ada, country manager of Visa Hong Kong and Macau. Apple Pay made its launch in Hong Kong in July 2016, while Android Pay followed with its launch in the territory in October 2016.